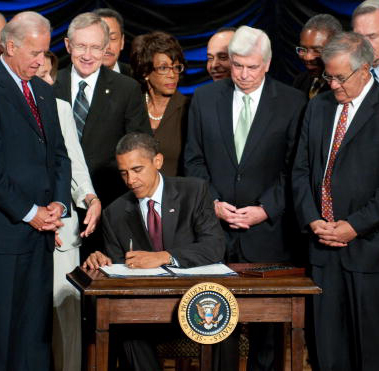 President Barack Obama signs the Dodd-Frank Wall Street Reform and Consumer Protection Act alongside members of Congress, the administration and US Vice President Joe Biden. July 21,2010. Congress set aggressive deadlines for regulators to make rules to enforce the law, and, unsurprisingly, they are failing to meet them. The agencies missed each of the 26 deadlines they were supposed to meet for April . So far, regulators have finalized 24 rules and missed deadlines on 28, according to the law firm Davis Polk. Jesse Eisinger and Jake Bernstein were awarded the Pulitzer Prize for National Reporting in April 2011 for a series of stories on questionable Wall Street practices that helped make the financial crisis the worst since the Great Depression.